Kristin Schattenfield-Rein is an American abstract painter. 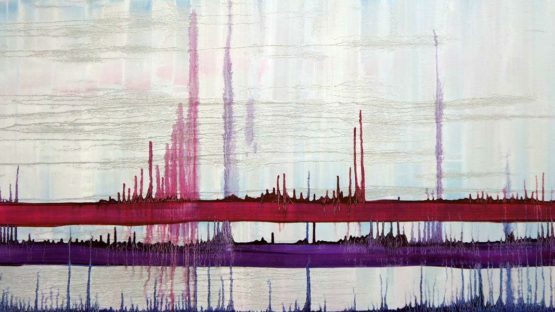 Using color, texture and chemical reactions on the canvas to create a universe within, her work is characterized by dynamic structures of growth, building, and the ideas of creation. Kristin Schattenfield-Rein grew up the youngest of seven children in the suburbs of Washington D.C. Kristin’s mother exposed her to a wide array of arts and culture. As a teenager, she was immersed in the subculture of D.C.’s underground punk rock scene, as well as studying at the Corcoran Museum of Art. Having studied fine art with Judy Pfaff and William Tucker at Bard College, Kristin moved to New York City, where she went on to work as Matthew Barney’s production manager on his Cremaster Cycle. Kristin’s current artistic philosophy began to take shape after having two children. Her entire studio practice and work evolved after becoming a mother. Her work is heavily influenced by her two young children – the blue represents her son, and the pink is her daughter. All of Rein’s works feature these two colors, fighting against each other in some and complimenting each other in others. She creates a form of painting with different mediums that produce a layered reticulative effect. While her background is in sculpture and metal working, Rein now focuses most of her energy on mixed media painting with a minimalist aesthetic. ‘I like to experiment with chemical reactions on canvas, combining them with color and texture and seeing what’s left behind,’ the artist herself states. Her latest work is concentrated on materials new to her, mainly epoxy resin, graphite flake and silvered tar, covered in a single, silver tone, giving the canvas a certain tactile quality. Kristin is forever pushing her work further by experimenting and creating new techniques, while honoring the techniques of the past. She currently lives and works in Philadelphia.